“How much does it cost to advertise on the radio?” This is the question I am asked every day. There is a lot of confusion out there about just how much radio advertising costs. With a little knowledge and understanding of how radio works, we can answer this question. Because bottom line… Just like the cost of a 5 star hotel room at the four seasons differs from “Moe’s motel and eat”. The costs of radio advertising vary greatly from station to station based on listenership. Effective radio advertising had two major components – “The Commercial” – The physical message itself and “The Radio Station” your commercials air on. First, Let’s explore the radio commercial itself. Before picking the radio station, you need to think about the message you are trying to convey to your target customer and what you want them to do. The key to the commercial is having a compelling call to action that drives your target customers to your business. The radio commercial production industry is full of voice talents, radio personalities, DJ’s and others, all claiming to create “radio commercials”. Be very cautious here… If you want a truly professional sounding radio commercial - look for a radio advertising agency that has experience and a track record of successful ad campaigns. Not just some guy with a microphone who likes to talk. Anyone can create a radio ad, but not everyone can create a radio ad that is effective and drives customers to your business. Another red flag to watch out for are the “free radio commercials” created by the radio station if you advertise on their station. While free sounds great - free commercials are never based on strategy and are just one of several dozen commercials that have to be created by an overworked radio production person in a five minute window of time. Remember, you usually get what you pay for. Professional radio commercial production agencies use solid, time tested formulas that maximize potential response. The talent is handpicked to best connect with the target customer and the production is based upon clear, quality, and easy to absorb audio messages. So…what does the radio commercial production process cost? The good news here is – Not all that much, when consider the quality of the end product. The price for a commercial that utilizes one voice usually falls in to the price range of $300 to $500 per commercial. When you add more voices or “jingle singers” to a commercial, you can expect to pay more. Knowing these numbers can save you a lot of money if someone tries to charge you more for a commercial. I would be very skeptical of anyone charging less than this for a “professional” commercial. Meaning I would question just how “professional” the work is. What are you paying for? These costs cover development of a solid strategy, copy from experienced copywriters, performance by high caliber voice talents, and the highest quality production services. This is where the biggest questions come into play. Questions about rates, station prices, placement times, etc. Let’s de-mystify what radio placement is all about. * Finding the best radio stations in a market that match your customer’s demographics (age, gender, income level, etc.) and psychographics (interests, beliefs, hobbies, personality traits, etc.). To match your message with. * Finding the times of day that best reach your target customer on the specific stations. * Selecting the top radio stations that most efficiently reach the highest potential QUALIFIED customers, the most times (defined as frequency), for the least amount of money. At my company, Best RadioCommercials.com here is how we determine what to spend on radio advertising costs. We explore the market you want to advertise in, we find the radio stations that have the best potential to reach your target customer (Based on the stations format Top40 and News/Talk and Soft Rock all reach very different demographics of people). We compare the latest ratings data on the radio stations that qualify to reach your target customers. This gives us a good idea of what stations will best reach your target customers. Once we have determined what stations will most effectively reach your target customer, we negotiate a plan with the radio station based on your goals, expectations and budget. We have access to data that allows us to compare rates against historical figures to determine if a stations price is out of line or in-line with the market averages. We use every resource we can to get you the most for your money. from $4000 to $8000 per week/per station for a top performing station. from $2000 to $5000 per week/per station for a top performing station. from $1000 to $3000 per week/per station for a top performing station. from $800 to $2000 per week/per station for a top performing station. from $500 to $1500 per week/per station for a top performing station. Then pour the radio commercial on to a radio station that reaches the target demo the commercial is designed to reach. (Pour on a lot of the radio commercial… don’t be shy – the more the better). Then set the timer for 1 – 3 months. Be patient because sometimes it takes time for the customers to rise to the offer of the commercial. After a period of time you will start to see the radio commercial take effect in the radio station. You will see this by increased calls, web hits, and most importantly a rise in revenue. Once the radio commercial has reached its desired size or awareness level. Be sure to add some great topping to the radio commercial. I personally like to take the core message of the already effective commercial and add to it. Maybe throw in some new specials or delicious offers. Be sure to spread the toppings on evenly as you don’t want to dilute the power and the taste of the original radio commercial. Once you’ve added the new toppings pour the commercial back on the radio station (again, don’t be shy – if your customers are going to rise to the offer, they need to hear it) Just as I wouldn’t bake a cake at 30 degrees and expect anything to happen, I wouldn’t air a radio commercial just a few times and expect anything to happen. So go for frequency, and get it on the air as often as possible in key times of the day for a significant period of time. If you follow these simple steps, you will walk away with a deliciously successful radio commercial campaign and the increased revenue to prove it. While businesses scramble to find the most effective mediums to spend their ever shrinking marketing dollars. One medium many thought was on the decline, not only remains strong: It’s actually growing. In fact 234 million Americans every single week listen to local radio. This data comes from Arbitron – (The radio equivalent to Nielson ratings in TV). This number shows us that radio listening is actually up by 2million listeners since June 2007. What makes this so interesting is the fact that the other main mediums consumers use for entertainment such as TV are seeing drops in viewership due to increased competition from the ever increasing and super segmented cable networks and other mediums. Radio being one of the oldest mediums for entertainment and information remains one of the strongest. One of the reasons that we have seen such a spike in radio listenership is the fact that radio remains a free, local and viable option to the consumer. On the same note: Radio remains to be one of the most cost effective ways for advertisers to reach their target clientele. When you compare the cost of radio commercials to that of direct mail, network TV, or even cost per click the difference is stunning. To break it down: Cost conscious small and medium sized business are discovering just how much more sense it makes to advertise with radio compared to other mediums. 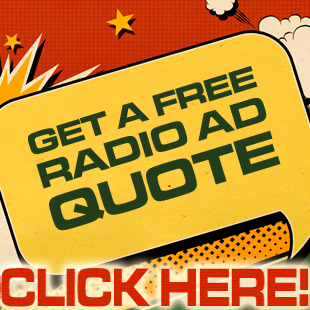 With radio you can on average reach 1,000 potential customers for around $0.14. Yes - that means it costs on average fourteen cents or less to reach one thousand people as a whole with radio commercials. By contract the cost of reaching one individual consumer would cost a business $1.00 to $2.00 dollars per direct piece, $1.00 - $2.00 dollar for an ultra expensive network TV spot, or $1.00 - $20.00 per click depending on the targeted keywords in an online campaign. It clearly makes more sense to reach one thousand consumers for quite literally pennies, as opposed to reaching only one individual consumer 40x times the cost of radio. Even when economic times are good, radio has proven to be one the most effective mediums to reach consumers. As long as radio remains free, provides compelling and entertaining content, and Aunt Hellen can have the opportunity to be caller number ten for free movie tickets…. Radio will remain one of the strongest mediums in the marketplace.